Host nation names a plenty, ten in total but only two survived the opening round of the Women’s Singles event at the 2018 ITTF Challenge Seamaster Nigeria Open on the morning of Friday 10th August; the two names with the greatest experience. Cecilia Akpan, 32 years old and Olufunke Oshonaike, ten years her senior, were the names to appear successful, both accounting for adversaries from Mauritius. Olufunke Oshonaike, the no.8 seed, beat Elodie Ho Wan Kau (11-9, 11-6, 11-4, 11-4), Cecilia Akpan, the no.16 seed, overcame Nandeshwaree Jalim (11-5, 11-6, 9-11, 11-6, 11-8). 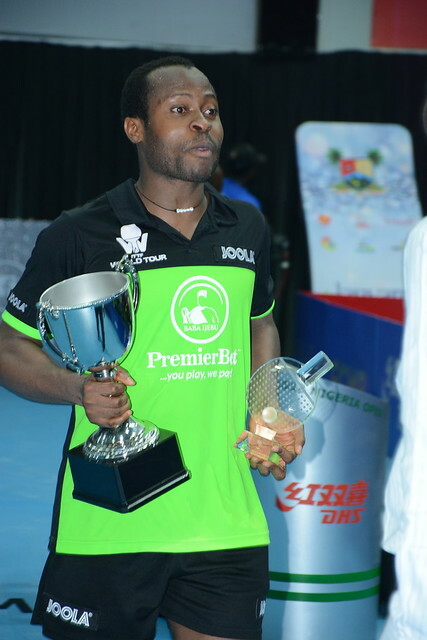 Success for two notable Nigerian names but it was China that, as in the qualification tournament, made its presence felt. Wang Shu caused the biggest upset according to status, by beating Italy’s Giorgia Piccolin, the no.3 seed and one year ago the Under 21 Women’s Singles champion (11-5, 11-8, 11-3, 11-9). Similarly, Wei Wensheng overcame Nigeria’s Offiong Edem, the no.11 seed (11-5, 11-7, 11-6, 11-6), Qiu Fenjie accounted for India’s Mallika Bhandarkar, the no.14 seed (11-6, 11-5, 11-3, 11-6). Meanwhile, both Guo Yan and Sun Chen prevailed against Russian opposition. Guo Yan ousted Olga Kulikova, the no.13 seed (11-2, 11-4, 11-7, 12-10), Sun Chen ended the hopes of Irina Ermakova, the no.15 seed (11-1, 11-3, 11-7, 11-1). Wins against the odds for five Chinese players, for a sixth it was according to status, Fan Siqi, the no.12 seed, beat India’s Maria Rony (11-5, 11-2, 11-6, 11-2). Defeats for seeded players and there was one more; Egypt’s Yousra Helmy, the no.10 seed, suffered at the hands of India’s Sreeja Akula (10-12, 11-6, 11-6, 11-8, 5-11, 12-10). Otherwise, with the exception of Giorgia Piccolin, it was success for the leading names at Nigerian expense. Thailand’s Suthasini Sawettabut, the top seed, beat Agnes Onoja (11-1, 11-1, 11-1, 11-3), Hungary’s Szandra Pergel, the no.2 seed, accounted for Oluwafunke Hassan (11-4, 11-4, 11-3, 11-7). Not to be upstaged, Luxembourg’s Sarah de Nutte, the no.4 seed, ended the hopes of Alimot Ayinla (11-7, 11-10, 4-11, 11-5, 11-7). The second round and quarter-finals of the Women’s Singles event will be played on Saturday 11th August.